Valletta 2018 Chairman Jason Micallef and Malta Fashion Week Executive Producer Adrian J. Mizzi at this morning's press conference about Malta Fashion Week. The Valletta 2018 Foundation, in collaboration with the Mercedes-Benz Malta Fashion Week, is supporting emerging fashion designers who will be showcasing their work to the public in Valletta during the fashion-filled event, running from the 14th to the 21st May. 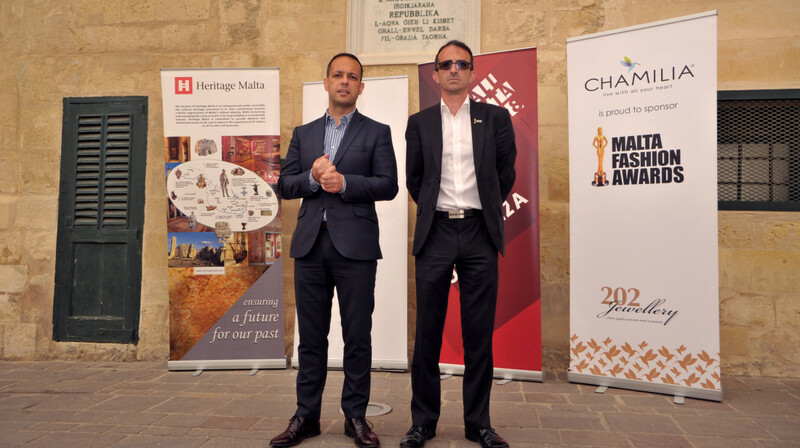 Addressing the media at City Lounge in Valletta this morning, Valletta 2018 Foundation Chairman Jason Micallef said “Valletta 2018 is proud to have the Mercedes-Benz Malta Fashion Week included in its European Capital of Culture Programme in the run up to 2018. Fashion is a major contributor to the world’s visual culture and this event provides a platform for local talent to showcase their artistry”. In light of this, he highlighted that a first of its kind design project, the Valletta Design Cluster will be opening its doors for designers and artists in the lower part of Valletta in 2018. Valletta will be hosting the ‘New Designers’ fashion show on Saturday 14th May in Republic Street at 11am, as well as a free photography exhibition which opens the same day at St George’s Square at 8.30pm. All other activities will be held across the harbour in Fort St. Angelo, Birgu. Now in its 6th edition, the Mercedes-Benz Fashion Week Malta 2016 promises to be an amazing week of high quality fashion shows and events that reach the highest standards of similar events worldwide.